This year, I’ve ran 5KM at the Energizer Night Race and 10KM at the TM Fan Run. Both runs went well, but to me, they were merely “fun runs”. 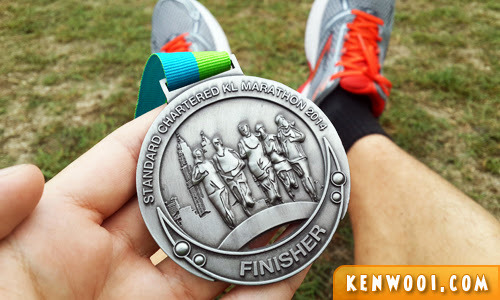 In fact, Standard Chartered KL Marathon (SCKLM) is THE run that has always been an avenue for me to improve my benchmark. Hence, SCKLM 2014 marks my 3rd participation in 3 consecutive years. Well, I sure hoped that I was running on a 21KM route – but I wasn’t ready for it. So I signed up for 10KM again this year. 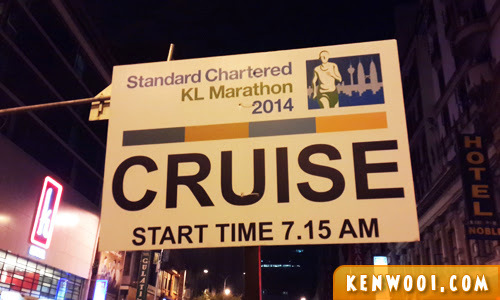 However this time, it’s the “Cruise” category – which means runners are required to complete the run within 1 hour 30 minutes. 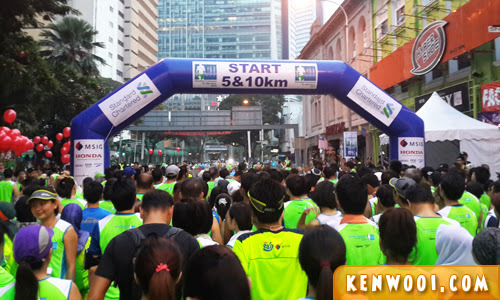 During SCKLM 2013’s 10KM “Leisure” category , I completed my first 10KM in 1 hour and 38 minutes at 9 minutes/km. Not bad, I’d say. 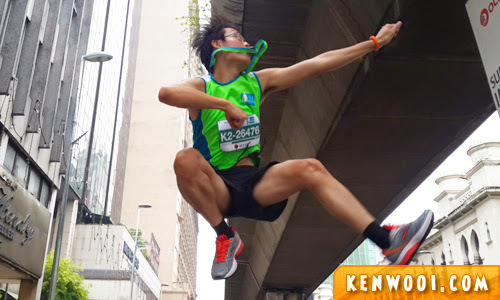 This year around, I’ve been training frequently and was really looking forward to my performance at the SCKLM 2014. 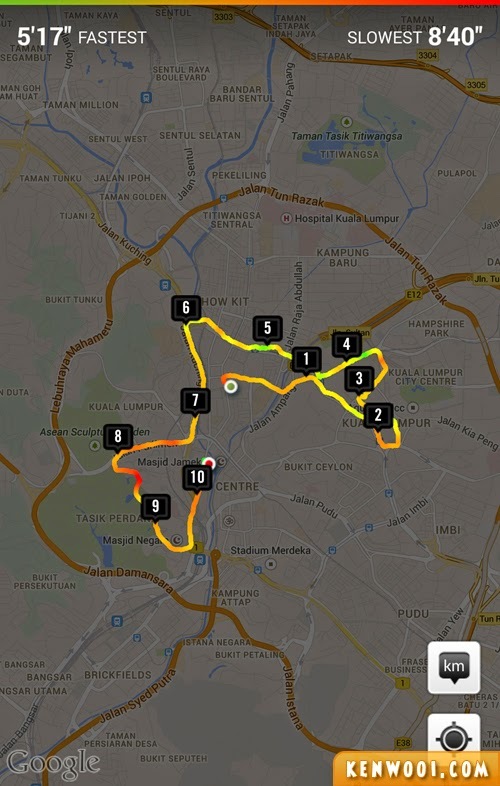 10KM used to be a feat for me back then, but today… it’s considered as a norm. During the run, I kept my pace consistent throughout and I managed to keep running until the 8KM mark where I speed-walk for about 2 minutes. After that, the momentum returned and I kept my running pace until the finishing line! Besides that, the 3-3 breathing technique (inhale and excel every 3 steps each) I used did help tremendously in maintaining my pace. Ultimately, the goal was to finish the run soonest possible. The outcome – 10KM in 1 hour and 9 minutes (personal best! ), with an average of 6’35″/km (personal best too!). Oh yeah! That’s my finisher’s medal and my brand new Brooks Ghost 6 running shoes! It does feel different running with Brooks. The Nike+ Running app has been my running companion since I own a smartphone. It has been a key device to track my training and its progress. 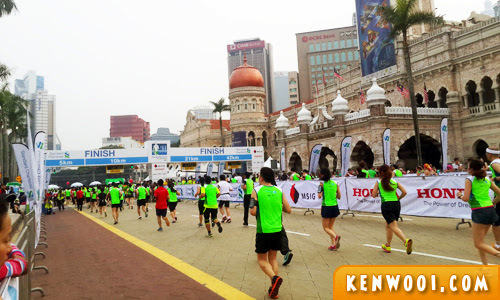 So yeah, 10KM at SCKLM 2014 – I DID IT, AGAIN… AT MY PERSONAL BEST! To more runs, and beyond! Congrats!!! Keep it up! 21 km next? hihihihi, so long no visit!